With our BootyBarre class growing in popularity, and the addition of its sister class Bbarreless every Saturday at 10am, we thought we would give you you the low-down on what these fabulous workouts are all about. 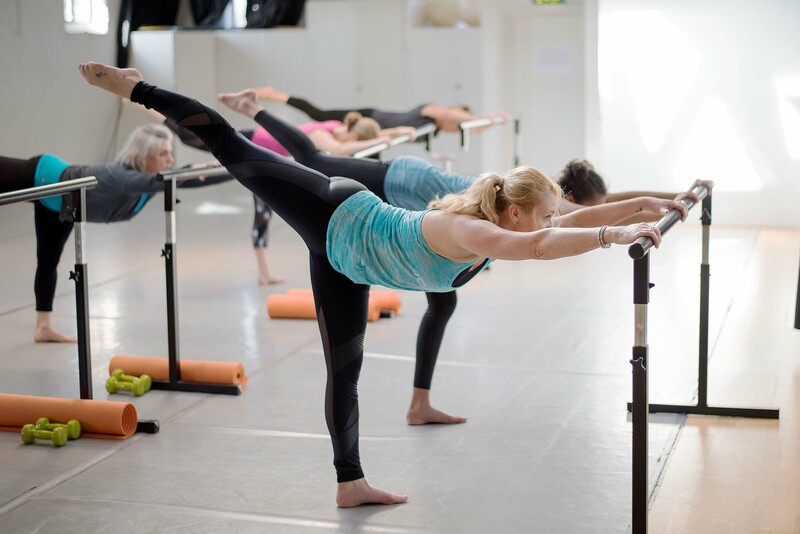 Not only are Bootybarre and BBarreless great fun (and set to a fab soundtrack), but their benefits are numerous: Improved posture, muscle definition, weight loss, increased flexibility and reduced stress. Plus, women at just about any fitness level can sign up for a class. Barre classes have also been shown to be suitable for pregnant women because of it’s low-impact nature. Barre classes may even help with imbalance (a common issue during pregnancy due to that growing belly) and stability. So you’ve taken the plunge and signed up for a class. Now what? A typical Bootybarre or BBarreless class will take you through a dynamic and invigorating workout. You’ll start with a warm up and sequence of upper-body exercises, which include free weights, push-ups, planks and other moves to target the biceps, triceps, chest, and back muscles. Next, you’ll use the ballet barre and your own body weight for resistance to focus on the thigh and ‘booty’ muscles. Your core will be engaged the entire class and then targeted at the end. For the cool down, you’ll go through a series of stretches to increase flexibility and allow your muscles to recover. I get a lot of people asking me what to wear for their first class. I tell my clients to think comfort: Leggings, a sports bar and tank are what most people wear. Increasingly my Bootybarre students are choosing to invest in a pair of ToeSox which I sell from the studio (prices start from £12) which help give you extra grip on the Dance Studio floor. One of the best parts of Bootybarre and BBarreless is that they combine strength training and cardio, so you’re burning fat and building muscle at the same time. My classes focus on strengthening muscles throughout the body, and with muscle tissue burning 15 times as many calories as fat tissue, the stronger you get, the more calories you’ll burn around the clock! Millie’s Bootybarre class runs every Wednesday at 6pm. Millie’s Bbarreless class runs every Saturday 10am. Luxury Pilates, Yoga and Mindfulness Retreats, Sicily Active Holidays, is the collaboration of longtime Fitness Professionals and personal friends of mine, Mike Mckone and Marina Thomas. Their luxury retreats offer guests the perfect balance of invigorating hatha yoga, toning pilates and calming mindfulness while enjoying the convenience of a full board stay at one of Sicily’s finest country estates, Villa Aranjaya. With Sicily Active, not only will you enjoy a week of Pilates, Yoga, Mindfulness and other exercise, you can also indulge in a menu of healthy, tasty Sicilian food and authentic local wines. Sicily Active Holidays have very kindly offered £100 off their beautiful retreats for all Millie Dobie Studio Members. Read more about their upcoming 2018 retreats at Sicily Active Holidays or to book, contact Mike and Marina.